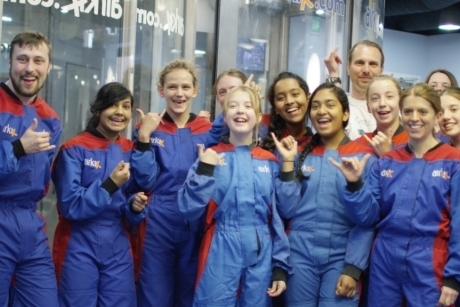 AirKix indoor skydiving company has teamed up with the University of Southampton to create a range of new Physics-linked experiences for schools. Icarus Physics of Flight School experiences are currently being rolled out at the AirKix attractions in Manchester, Basingstoke and Milton Keyes, as part of a wider project designed to engage Secondary school pupils with STEM subjects. The experiences have been developed in conjunction with Dr Angelo Grubisic and his skydiving team of astronautics and aeronautics students from the University of Southampton. Dr Grubišic is a lecturer of Astronautics at the University of Southampton. He has also worked in the astronautics industry, developing spacecraft for NASA’s Jet Propulsion Laboratory and sending probes to Mercury with the European Space Agency. What do the Physics lessons involve? Pupils taking part in Icarus Physics of Flight School sessions will first get to find out more about the Science of how a wind tunnel works; the power of the fans; and why air heats up and how air is cooled. Students will also discover facts about terminal velocity – such as how skydivers control their flight and stability – and how parachutes, pilot chutes and reserve chutes work. The class can also enjoy an audio visual and practical demonstrations of wingsuits and wing inflation, plus learn about aerodynamics, wingsuit design considerations, and how to control a wingsuit in flight. The sessions will culminate in two flights in the indoor vertical wind tunnel which allows participants to employ the aerodynamic principles they've learned using their own bodies as they fly in a 100 miles per hour air-flow. Dr Sarah Barton, a Science teacher at Bishop Challoner School experienced one of the launch sessions for the Icarus Physics of Flight School. She said: “We brought the kids to this event so that they can learn more about the application of Physics to skydiving. They have to learn about it for their GCSEs so it’s a fantastic way to get a hands on-experience. “These types of events really help to keep their interest in Science going." For further information visit www.airkix.com.